(2017) Data driven kinetic sculpture. Wood, Raspberry Pi, screen, Arduino, motor & custom software. “Cyma” (from Greek: κῦμα, meaning “wave”) is a real time data driven kinetic sculpture highly inspired by natural repeatability and wave movement. An array of wood planks, connected only with a nylon thread passed from the center, is hanged from the ceiling and reaches the floor. 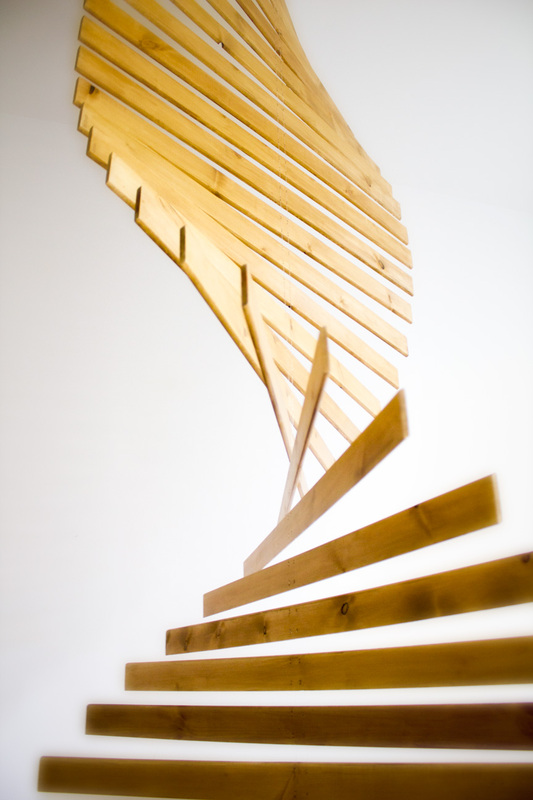 The bottom plank is rotating periodically and sets the whole sculpture in motion. 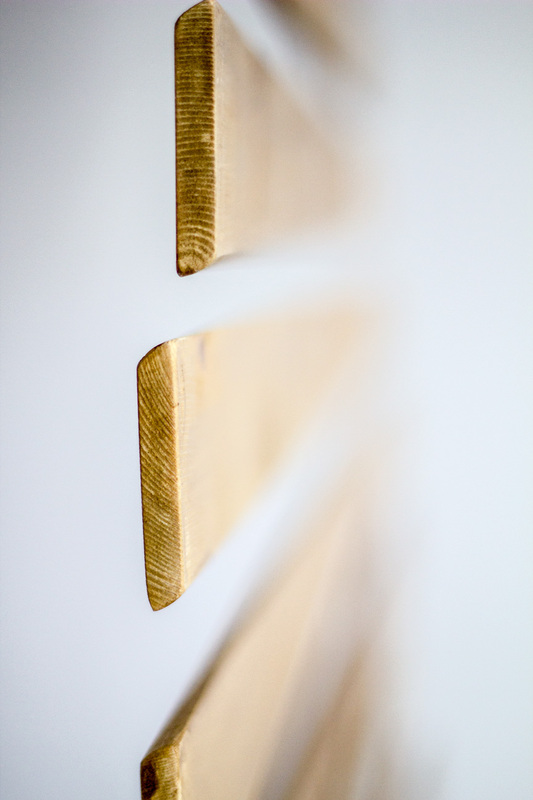 The motion of the bottom plank is creating a wave that physically spreads from one wood to the other. Real time data of the solar wind are defining the motion of the wave. 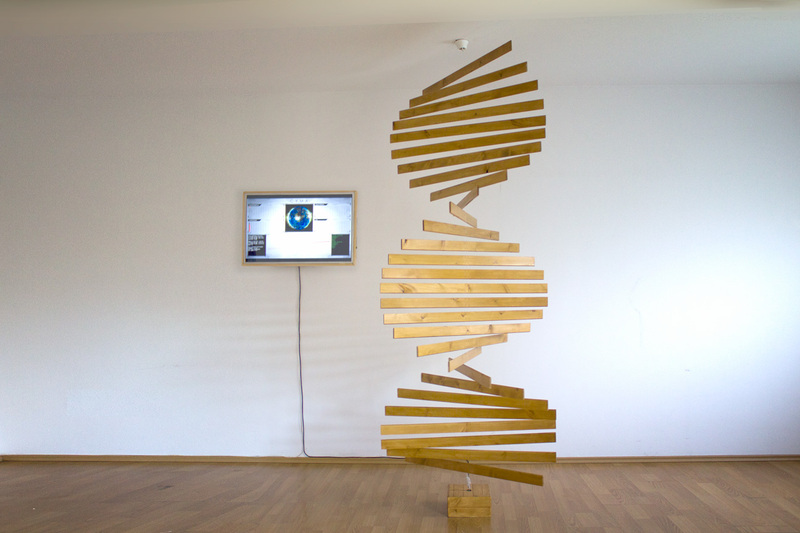 The whole sculpture is waving without any mechanical force (except from the bottom plank), in the natural fundamental frequency and in higher modes called harmonics in a hypnotic and mesmerizing way. The movement of the sculpture is driven in real time by live data of the solar wind. The strength of the wave movement (amplitude of the modulation) is controlled by the solar wind speed and the mode of waves (fundamental or harmonics) is controlled by north-south direction of the interplanetary magnetic field (Bz). A screen placed near the sculpture, projects the data and movement visualization. The Deep Space Climate Observatory (DSCOVR) mission is now the primary source for real-time solar wind and interplanetary magnetic field data but there is one more satellite at the Sun-Earth L1 point that measures the incoming solar wind and and that is the Advanced Composition Explorer. This satellite used to be the primary real-time space weather data source up until July 2016 when DSCOVR become fully operational. 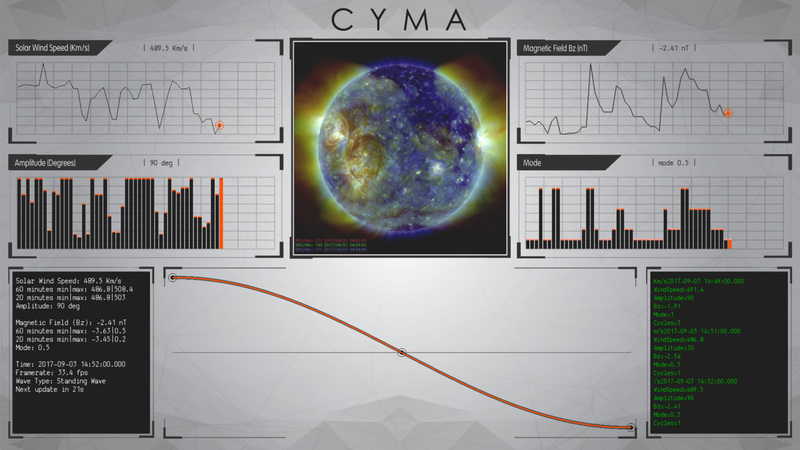 Animation of the satellite at the Sun-Earth L1 Lagrange point collecting the solar wind data. 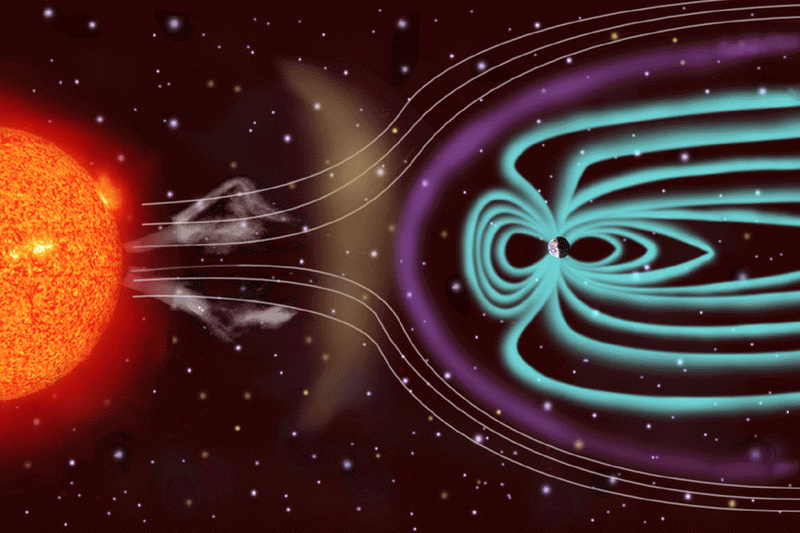 The interplanetary magnetic field (IMF) plays a huge rule in how the solar wind interacts with Earth’s magnetosphere. In this article we will learn what the interplanetary magnetic field is and how it affects auroral activity here on Earth. During solar minimum, the magnetic field of the Sun looks similar to Earth’s magnetic field. It looks a bit like an ordinary bar magnet with closed lines close to the equator and open field lines near the poles. Scientist call those areas a dipole. The dipole field of the Sun is about as strong as a magnet on a refrigerator (around 50 gauss). The magnetic field of the Earth is about 100 times weaker. The magnetic field of our Sun doesn’t stay around the Sun itself. The solar wind carries it through the Solar System until it reaches the heliopause. The heliopause is the place where the solar wind comes to a stop and where it collides with the interstellar medium. Because the Sun turns around her axis (once in about 25 days) the interplanetary magnetic field has a spiral shape which is called the Parker Spiral. The Bt value of the interplanetary magnetic field indicates the total strength of the interplanetary magnetic field. The higher this value, the better it is for enhanced geomagnetic conditions. Moderate Interplanetary Magnetic Field strength values start at 15nT but for middle latitude locations, values of 25nT or more are desirable. Auroras are produced when the magnetosphere is sufficiently disturbed by the solar wind that the trajectories of charged particles in both solar wind and magnetospheric plasma, mainly in the form of electrons and protons, precipitate them into the upper atmosphere, where their energy is lost. 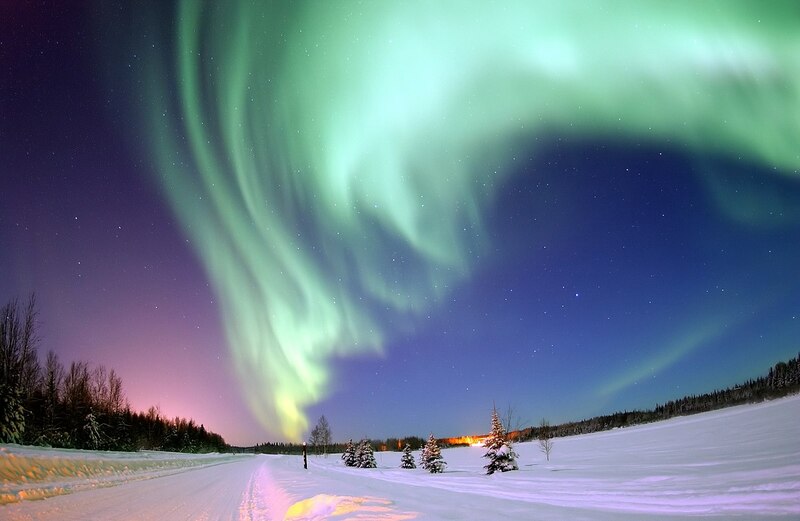 The resulting ionization and excitation of atmospheric constituents emits light of varying color and complexity (https://en.wikipedia.org/wiki/Aurora). The Aurora above Bear Lake — Eielson Air Force Base, Alaska (18 January 2005).